BUY 2 and save even more - always free shipping! Need a high performance, multi-band, stealthy antenna system that is easy to setup and use? 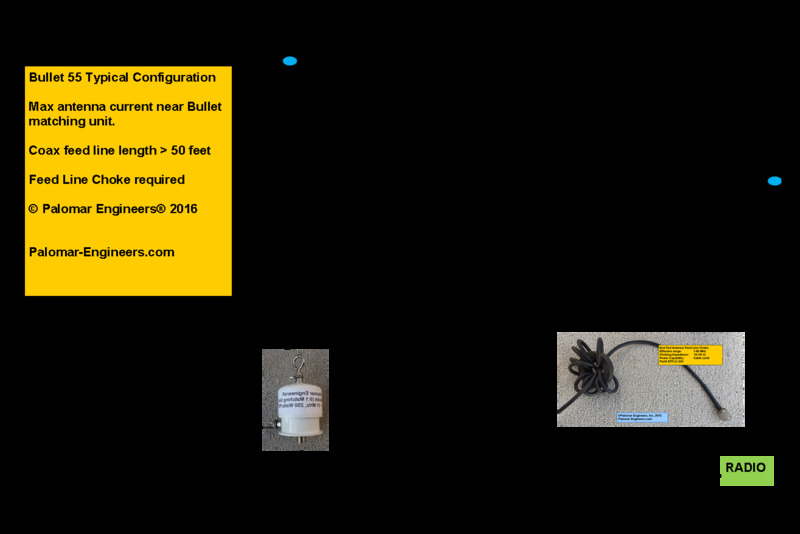 Get the Bullet, the antenna wire and insulator all in one convenient package (great for HOA restricted areas, camping and portable operations, etc.) and don’t forget to add the feed line choke. (160-80-40-30-20-17-15-12-10 meters – 71 feet of 14 gauge, insulated wire, dog bone end insulator). 160 and 80 meters require a antenna tuner and possibly other bands depending upon individual installation. One of the most popular antennas today is the end fed due to it ease of installation, portability and stealth in various installations. It can be a condo dweller’s only access to the world of ham radio or the best alternative for a backpacking SOTA (Summits on the Air) mountaintop expedition. The antenna is simple to deploy, folds up easily for transport, and weighs under a pound, yet, with the 71 foot included wire, can work the 80-10 meter bands easily with the built in antenna tuner of most current day transceivers. The key to the antennas success is the matching network interface between the long wire antenna and the coax feed line to the transceiver. 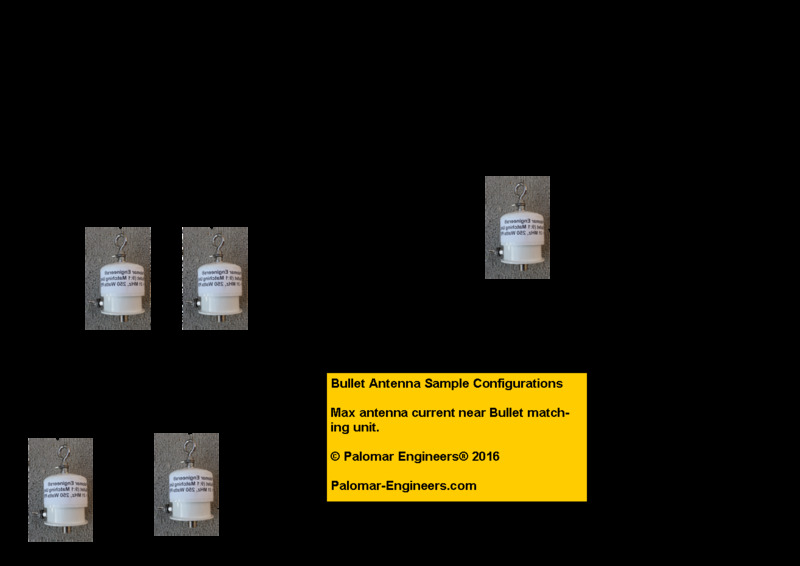 Palomar Engineers employs a dual core matching system that offers wide bandwidth (1.8-61 MHz), 500 watt PEP rating, and a connection for a counterpoise or ground if desired, and a SO-239 female coax connector for easy attachment of coax cable (50 or 75 ohm is ok). The antenna can be used as a sloper, “L” with a vertical section and a longer horizontal section, or as a random horizontal antenna between two trees or supports. 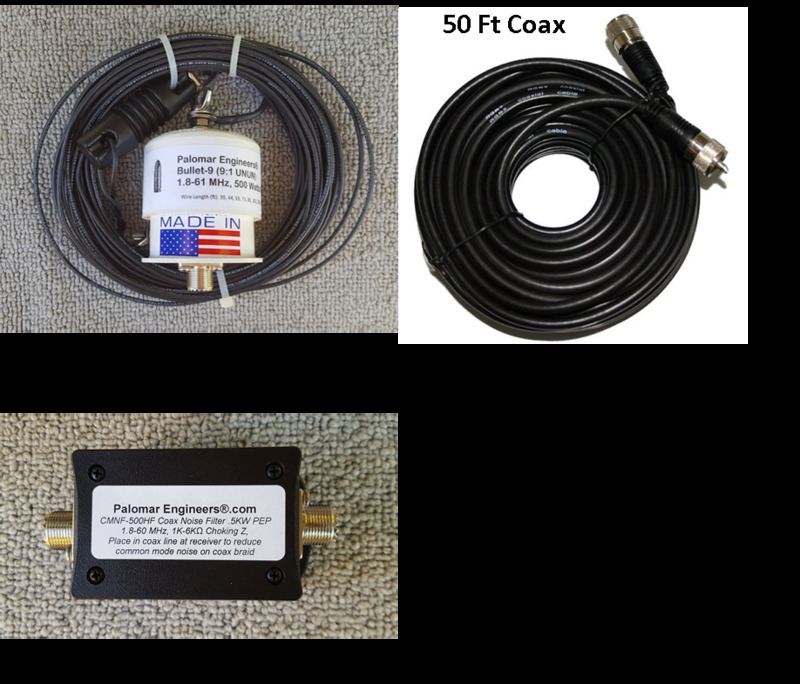 If you run more than 500 watts PEP and need a high power 9:1 unun for your end fed antenna, check out our 1-7.5KW PEP ununs. 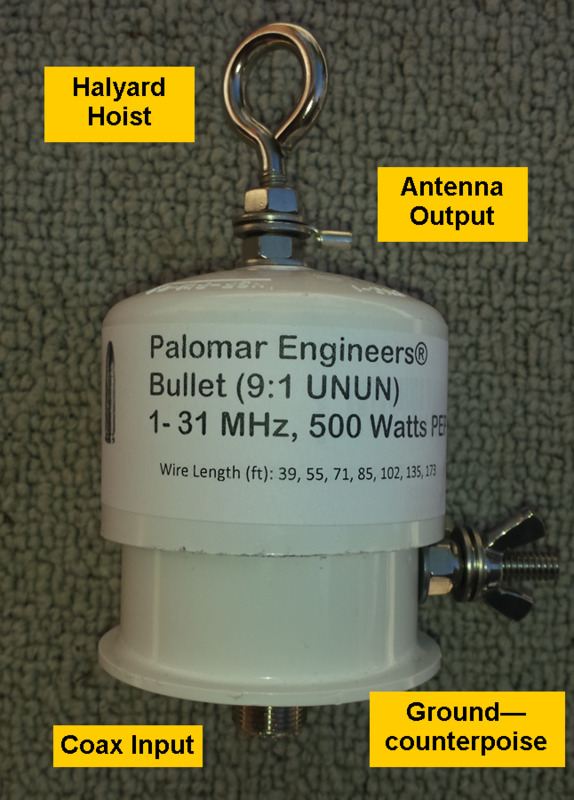 For best results raise the Bullet matching unit as high as possible (use a tree or vertical support) and then extend the antenna wire horizontally or as an “L” (horizontal with vertical end drop).The antenna may also be deployed as a sloper with the Bullet matching unit at the top (best) with the wire sloping toward the ground (with the end high enough to avoid contact by humans or animals), or at the bottom of the sloper with the antenna wire rising to a higher point (see typical configurations on next page). Antenna Length Modifications: For best results, chose a length from the table above as these lengths will form a non-resonant antenna for the amateur bands indicated.The antenna length should NOT be ¼, ½ wavelength on any frequency that you transmit as the impedance will be very high (or low) and will not transfer through the matching unit at a favorable impedance to your antenna tuner.The theory of the antenna length is to make the antenna non-resonant on any amateur band so that the impedance at the antenna side of the matching unit is in the range of 200-600 ohms and when divided by 9 will be in the range of your transceiver antenna tuner. Use a good quality 50/72 ohm cable adequate for the power level of your station.The Bullet-80 matching unit is rated for 500 watts PEP for SSB and 150 watts continuous carrier for AM, FM, digital modes, or 375 watts CW.If the matching unit becomes warm to the touch after transmitting at high power, reduce the power output or the internal matching unit may become damaged. NOTE: The matching unit output is DC grounded to bleed off static electricity, however it is not RF grounded as the RF signal (at the coax connector) will see approximately 1/9 of the RF impedance on the antenna terminal of the matching unit (if the antenna impedance is between 200-600 ohms).